BAGHDAD, Iraq (CNN) -- Iraqis "want us want us to be engaged with them in helping them realize their potential," said Vice President Joe Biden after leaving Baghdad on Saturday. 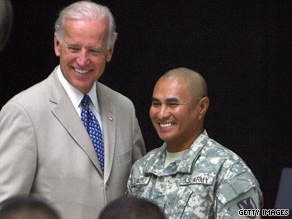 Vice President Biden congratulates a soldier who became a U.S. citizen on Saturday. "They're very concerned, very anxious that we pursue a strategic agreement with them, which has nothing to do with the military. They want scientific knowledge, they want educational assistance, they want economic assistance in terms of advice and connecting them, giving them advice on how to deal with the international business community," Biden said Saturday in an interview aboard Air Force Two before flying out of Iraq, according to pool reports. Meanwhile, a spokesman for the Iraqi government said Iraq will cooperate with Biden, with him serving as a link between Washington and Baghdad, but rejected the notion that the United States would play an active role in Iraqi national reconciliation or resolving the country's political tensions. "The unified Iraqi will, with no dispute, is that we want to resolve our issues amongst us," spokesman Ali al-Dabbagh said on al-Iraqia State TV Saturday evening. "If the Iraqi government needs any assistance from the U.S. government, the American government is ready to provide the support and assistance. But the prime minister said these are internal issues that Iraqis will handle," he said. "Involvement of non-Iraqi parties in these issues will complicate things and create problems we can live without." Al-Dabbagh said Biden "fully understood" this and showed support for the current Iraqi government. Tension between Iraq's central government and the Kurdish regional government over disputed territories and distribution of oil wealth has been growing since the Kurdish parliament last month passed a new draft constitution. The draft included disputed territories like the oil rich city of Kirkuk and other territories in Nineveh and Diyala provinces as part of the regional government. The constitution will be put to a national referendum during Kurdish elections at the end of the month. Biden said the Iraqis are "painfully aware" of their own unresolved political issues, "from the disputed internal boundaries to the Sons of Iraq to the oil law to revenue sharing," and that the United States' ability to assist on other fronts was "likely to be impacted [by] their ability to get it right on the political side." A roadside bomb on Saturday underscored Iraq's instability. It exploded in an outdoor market in the Yusifiya area south of Baghdad city, killing a civilian and wounding 15 people. Biden's visit to Iraq also came days after U.S. combat troops formally left Iraq's urban centers and handed security duties over to local security forces. Biden said the United States honored that commitment and will make good on others leading to a drawdown of U.S. troops from a country long upended by war. "Next summer our combat troops will leave Iraq itself and we will be on track to remove all U.S. forces from Iraq at the end of 2011," he said during a naturalization ceremony in which 237 U.S. service members were sworn in as American citizens. Standing in the shadow of a 50-foot American flag, the service members recited the Oath of Allegiance and the Pledge of Allegiance in the rotunda of the Al-Faw palace, once a palace belonging to toppled dictator Saddam Hussein. Biden extolled America's "remarkable, remarkable diversity" and its destination as a refuge for immigrants, saying newcomers are the "lifeblood" of the country and that "there's always room for more." "As corny as it sounds, damn I'm proud to be an American," he said. "Thanks for choosing us, you are the reason why America is strong." Gen. Raymond Odierno, the top U.S. military commander in Iraq, also lauded the new American troops and noting the appropriateness of a naturalization ceremony on the Fourth of July in Iraq. Invoking the words "give me your tired, your poor, your huddled masses yearning to breathe free" from the Emma Lazarus "New Colossus" poem inscribed at the Statue of Liberty, Odierno said, "to be honest I'm not so sure that its legendary inscription is applicable to this group here today, because when I look at the men and women sitting out in front of me here, I'm having a hard time because I don't see them in terms of tired, poor or huddled." Biden later met with troops from his home state of Delaware, including his son, Beau, and he visited the mess hall where a Fourth of July feast was served. Biden later joked to U.S. troops over the significance of holding the ceremony in a palace that was once a symbol of the former dictator's iron-fisted regime. "That S.O.B. is rolling over in his grave right now," he told troops.